Without a doubt, one of the most misunderstood aspects of the Christian life is what we mean when we say that we “heard from the Lord”, “received a prompting from God”, or otherwise received specific divine direction. The Power of a Whisper: Hearing God. Having the Guts to Respond. is a decent, basic, easily readable explanation of what it means to hear God’s voice, but I felt that it lacked depth. I should point out that I received an advance reading copy of the book, which at this writing is not yet available for sale, so perhaps some of my problems with the book will be corrected in the final publication copy. Chapter 4, “How to Know When You’re Hearing from God,” is probably the most important chapter in a book like this. 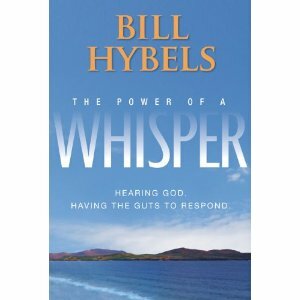 Hybels shared 5 filters that he uses to “test every whisper” he hears – to make sure they are from God. But, here I was a little confused, because the first filter was “Is the Prompting Truly from God?”. I think his point here was simply to emphasize that not every “prompting” or “whisper” is from God – but that was the point of the whole chapter anyway. The other four filters he listed were: “Is it Scriptural?”, “Is it wise?”, “Is it in tune with your own character?” (another one I had a problem with) and “What do the people you most trust think about it?” Hybels referred to the “Is it in tune with your own character?” test as the “wiring test,” and while I understand his point that God typically does not ask us to do something that is out of character with the way he wired us – that is not always necessarily the case. The Scriptures are full of examples of the most unlikely people being asked to do things that could be considered completely out of character for them. The Lord sometimes uses such unlikely assignments to shape and mold our character to be more like His. The Power of a Whisper isn’t a bad book. Hybels gives a number of inspiring examples of the benefits of listening to God’s whispers, and a few examples of the consequences of our inattention. But there are much better books on the subject in my opinion. Consider Dallas Willard’s Hearing God: Developing a Conversational Relationship with God, or Henry and Richard Blackaby’s Hearing God’s Voice, or a resource specifically geared to discerning God’s will for your life such as M. Blaine Smith’s classic Knowing God’s Will: Finding Guidance for Specific Decisions. I like to read Hybels on leadership, but just think that others have done a better job with this important topic.